EAST LANSING, Mich. — We are finally seeing some warm conditions this spring, so honey bee colonies are being brought back to Michigan by commercial beekeepers. We are also seeing wild bumble bees, mason bees, and digger bees starting to emerge from their overwintering. These are all welcome signs of spring, as are the reports of apricot bloom starting in southwestern Michigan. With bloom season approaching for our fruit crops, we want to remind growers of the main tactics for reducing the risk of pesticides to bees. A lot more detail on this topic can be found in our free Michigan State University Extension publication E3245 “Minimizing pesticide risk to bees in fruit crops”. This is a 16-page bulletin available from the MSU Extension bookstore. It contains a series of tables that show the relative risk of the common fruit crop insecticides and fungicides. The bulletin goes into depth on these topics, but here are some of the basic ideas behind the recommendations for reducing pesticide risk to bees. Use integrated pest management (IPM) to reduce the need for sprays. 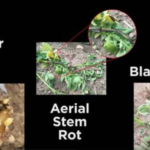 Disease models are available at the MSUEnviroweather website and extension recommendations highlight the periods of infection risk that require fungicide applications during bloom. This can potentially reduce the need for treatment during dry springs. Using traps, degree day models, and thresholds for insect pests can also reduce the need for insecticide sprays. Encourage biological control and increase the use of cultural controls where possible. Avoid pesticide sprays during crop bloom. 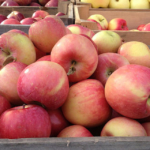 Diseases and insect pests require active management in commercial fruit production. But orchards and fields of many fruit crops also need bees for pollination, and weakened hives will not provide the same level of pollination as strong ones. So consider the effects on pollinators when selecting pesticides. Apply pesticides after sunset or before sunrise, or when air temperature is below 50°F. This is one way to reduce direct exposure of pollinators to pesticides. It can be challenging on large farms or when spring weather provides a slim window of suitable conditions, but some beekeepers have reported improved colony health at farms that have adopted this practice. 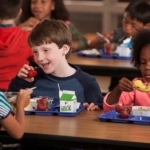 Select the least toxic pesticides and formulations when possible. 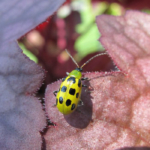 The MSUE Fruit Pest Management Guide (E154)provides information on relative risk to pollinators, natural enemies and predatory mites in some tables. This information is based mostly on toxicity to honey bees, and it can be a good way to compare among products. Also, see the tables in the E3245 mentioned above. 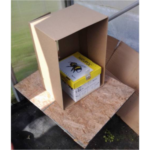 When there are multiple formulations of the same product available, select the liquid or dissolvable formulations over dusts as those can be picked up with pollen by bees and taken back to the hive. Reduce drift onto areas outside crop fields. Reducing drift is part of the state pesticide training, because it is critical for avoiding unintended effects on wildlife, water sources, etc. Bees will gather pollen and nectar from flowers outside crop fields, and the wild bees will also nest there, so it is important to keep the application where it was intended. Springtime sprayer calibration, targeted application, and nozzle selection to reduce fine droplets can all help keep sprays where they are intended. 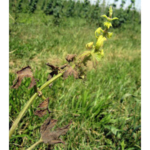 Remove flowering weeds from crops. 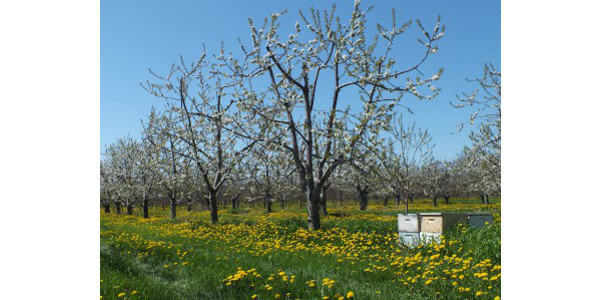 Access to a diversity of food sources is helpful for bee development, but if the drive rows in your fruit planting contain a carpet of blooming dandelions, clover or other bee-attractive flowers, plan to mow them before spraying to help reduce pesticide exposure – not just during bloom, but through the entire growing season. Provide bee-friendly habitat away from crops. These can be trees, shrubs, wildflower plantings, or unsprayed flowering cover crops that bees like to visit. Wild bees also need places to nest and develop their offspring. 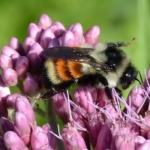 A separate guide on this topic is online in another free bulletin available for free download at Establishing Wildflower Habitat to Support Pollinators of Michigan Fruit Crops. 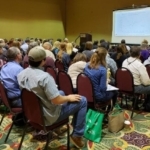 Develop and implement a pollination contract with your beekeeper. Pollination contracts are often sealed with a handshake agreement. But a written agreement can clarify how many colonies will be delivered, where and when by the beekeeper and what the grower should do to alert the beekeeper if there are treatments being applied nearby. Example contracts are easily found online as a way to get started.